Sunday was a very historic day, at least to me. I organized and hiked the first ever EduHike! 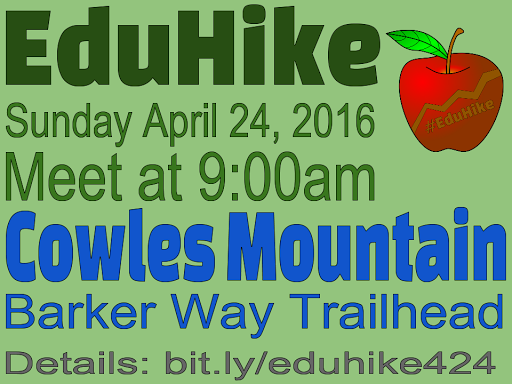 I thought of #EduHike in February 2015, and played around with the idea in my head. Finally, last November I actually started taking steps to plan the first ever EduHike. The basic concept is to pick a place, date, and time, and invite teacher/education friends to join you. No set agenda other than get some awesome people together, hike, and chat. (Post-hike food or coffee gathering is optional. We met up at an injured friend’s house after, so the non-hikers were included.) 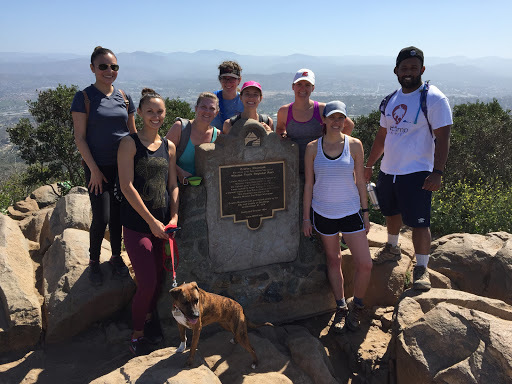 I’ve done the Cowles Mountain hike many times, which is why I chose it for the first #EduHike; I wanted a place where I was familiar, and didn’t have to think about navigating and hosting. The hike was about 45 minutes up, we spent 15 minutes hanging out at the summit, and about 35 minutes going down. Next time, I’m planning to explore a new hike, and take along someone who has done that hike already. The #EduHike was great! I loved meeting a new friend, and seeing quite a few familiar faces. In total, we had 8 humans and 1 dog on our hike. During the hike, there was plenty of opportunity to chat with everyone. Too often at conferences and other meet-ups, we spend a lot of the time looking down at a device, and not making real connections. Or, we’re too busy Tweeting, blogging, and Voxing to sit down with our PLN and just talk. Even though a lot of the conversation was face to back-of-head (safety! ), I felt like the collaborative discussions I had were productive and pushed my thinking in new and deeper directions. There’s something about being outside that allows us to relax and happily share our successes and struggles as teachers. I’m thankful for you all for taking time on your busy Sunday morning to join me on this adventure! Here’s the vlog I made on the hike. Vlogging is way out of my comfort zone, but I’m determined to practice and get better (and less awkward!). #EduHike round 2, coming summer 2016! I wake up every morning so grateful for my PLN. When I envisioned becoming a teacher, I never thought it would mean I would be connected with teachers from all over the country and world. In fact, I didn’t think teaching would cross paths with social media, especially Twitter. I created my personal Twitter account back in summer 2008 (No, I’m not sharing my handle…it’s private anyway!) and used it strictly for my random thoughts, what I was currently doing, and to briefly talk to my friends. After a few years, it wasn’t as versatile for social use, and I dwindled my use. And, don’t get me started on my rant on hashtags. #hashtagsarenotparentheticalremarks. The end. Game over. But really, from the beginning of my Twitter use, I saw the purpose of hashtags to aggregate data and Tweets. I rarely used them, but was conscious of their purpose. During my break from the Twitter world, I was vehemently against using hashtags, except for their intended purpose. I still cringe when people write things on Facebook and use hashtags for parenthetical remarks. Come on people, just say what you want to say. When I started attending education conferences, my eyes were opened to the wider world beyond my classroom. So many teachers were on Twitter and connecting, I realized I needed to be a part of this. And, finally, hashtags were being used in a useful way! I jumped right in and started networking. As with any new technology (or language for that matter), I went through the silent phase. I watched other people tweet, and was too scared to say much of anything in reply. I got jittery posting a tweet, since it’s really not like me to put myself and my thoughts out in the open. Then, I started interjecting a few ideas here and there, adding to conversations, asking questions, and sharing my own experiences. From there, it all became an exciting and non-stop adventure! 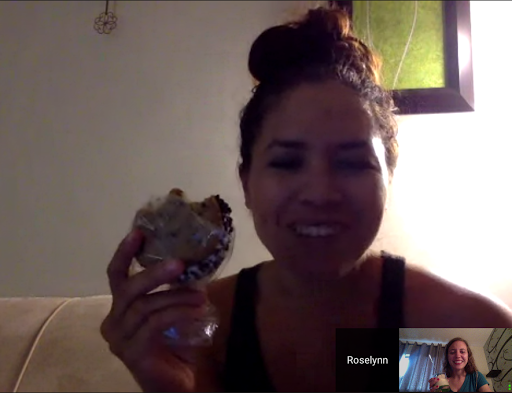 Rosy and I had dessert together via GHO! Over the past year and a half, I have become a highly connected educator. There are members of my PLN (Justin Birckbichler and Rosy Burke!) that have become some of my closest friends, even though we haven’t met face to face. It is amazing to wake up each day and have meaningful conversations with teachers who enjoy teaching, and want to push me to be a better teacher. If I weren’t a connected educator, I wonder how long it would take me to burn out and become one of those negative and boring teachers?